Geek Wrangling 101, with an expert. Port your Web app to Facebook. 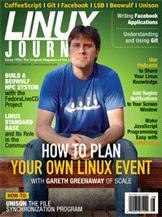 LSB and what it means for the Linux community. A guide to what many consider the best version control tool ever created. Do you know something about Linux? A podcast is an excellent way to share your knowledge with others. Build a Red Hat-based Beowulf Cluster using a kickstart file and tools from the FedoraLiveCD project. Tips and tricks for creating radio dramas with open-source software. The file synchronization tool that supports bidirectional updates of files and directories. Kyle Rankin and Bill Childers' Tales from the Server Room It's Always DNS's Fault!